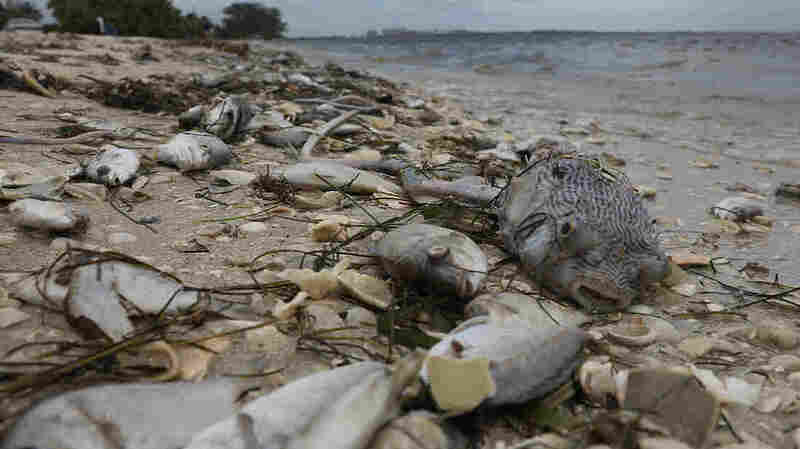 Scientists Battle Red Tide That Turned Florida Coast Into Wildlife Killing Field Scientists are exploring how they can combat the spread of the toxic algae bloom known as red tide along Florida's southwest coast. Hundreds of fish killed by red tide are washed ashore in Sanibel, Fla., this month. The current red tide has stayed along Florida's southwest coast for around 10 months, killing massive amounts of fish as well as sea turtles, manatees and a whale shark swimming in the area. Red tide is a type of toxic algae that naturally blooms almost every year in Florida, but this current bloom has persisted since last November and spread over nearly 145 miles of coastline, according to the Florida Fish and Wildlife Conservation Commission (FWC). Breathing problems caused by red tide coupled with the smell of dead fish have driven people off the beaches. Florida Gov. Rick Scott has declared a state of emergency for seven counties affected by red tide, which will funnel an additional $3 million for research, cleanup and wildlife rescue to those counties. Although red tide is a natural phenomenon, this bloom is particularly extreme and damaging, and likely fueled by climate change, says Richard Pierce, senior scientist and program manager for ecotoxicology at the Mote Marine Laboratory in Sarasota, Fla.
"What we're looking at is an environment that has been totally altered because of the dead fish decaying, they use up all the oxygen," he tells Here & Now's Robin Young. "It's not suitable for life." Scientists at the Mote Marine Laboratory are conducting experiments to combat the spread of red tide and prepare for future outbreaks, Pierce says. They are testing a process that pulls red-tide-infected water from canals into 25,000-gallon tanks, treats it with ozone and pumps it back into the ocean. Pierce says the use of ozone to purify water is similar to the process used to cleanse aquariums and swimming pools. "It's very highly reactive, and if it gets around any cell or any organic matter, it immediately destroys it," he says. "So ozone is great for killing the organism, and it's also good for destroying the toxins." The experiments were successful in removing red tide and its toxins, and the water chemistry returned to normal within 24 hours, the president and CEO of Mote Marine Laboratory, Michael Crosby, told Reuters. Scientists are also exploring if they can fight red tide by introducing other types of algae into affected areas. Diatoms are a type of microalgae that compete with red tide for nutrients, Pierce explains. There are also other types of large algae that release chemicals that inhibit the growth of red tide. But Pierce warns scientists have to be careful that what they do doesn't make conditions worse. "Maybe you could grow these algae around the ends of canals and in small embayment areas, which would actually inhibit the red tide from going in there in the first place," he says. The last time a red tide bloom of this intensity ravaged the Gulf Coast was between 2004 and 2006, according to the AP. Warming waters fuel red tide growth and offshore winds push algae closer to the shore, prolonging red tide's presence on the coast, says Heather Barron, a veterinarian and research director at the Clinic for the Rehabilitation of Wildlife in Sanibel, Fla. Heavy fertilizer runoff from Hurricane Irma last year could also be having an impact, she says. When red tide blooms and dies, it releases toxins that can cause neurological damage in both humans and wildlife, Barron says. "This organism produces a toxin known as brevetoxin that is a neuro or nerve toxin," Barron told Here & Now's Jeremy Hobson. "And so what we see is that these animals' nervous systems are very affected by this toxin. They become very disoriented, and potentially if the toxin levels get high enough, they can even die." This bloom has killed some 452 sea turtles, nearly 100 manatees, 11 dolphins and tons of fish, according to the FWC. It's so bad that SeaWorld in Orlando has begun taking in manatees affected by red tide. People with respiratory issues are particularly vulnerable to red tide exposure, Barron says. When people eat shellfish tainted with red tide, they can experience gastrointestinal distress and sometimes develop neurological problems similar to wildlife. To effectively battle future red tides, scientists are trying to understand it better. "I don't think that we're going to be able to stop red tides from occurring. They are natural," Pierce says. "The question is: Is human activity enhancing it, causing it – once it gets to the coastal region — to be worse?"